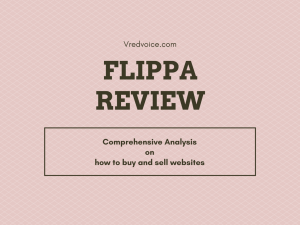 Flippa has become the most sought after marketplace to make a quick profit by selling websites. But, only 10% to 25% of the websites listed on Flippa sells. The other website listings just gets wasted and increases the acquisition cost for the seller. Selling and buying a digital asset requires a lot of prudence to make handsome profit. Now, in this article let us see what we as a seller or buyer need to know before making our decision. Flippa is a great ecosystem for sellers to sell their website. People have a lot of money and are ready to buy, but the only hindrance is, this market is filled with bogus websites. It has become hard each day to find a quality website to buy. If you follow the above 6 recommendations I am 100% sure that you are on the right track and no one can stop you from succeeding. Now let us see why you need to follow the above 6 recommendations. There is no need for explanation, but still let me tell why being honest is the most important factor for selling websites. When you talk with buyers there will be a lot of questions about your website. Believe me, for most of the questions the buyer would know the answer and he is just testing your honesty. You might be in an urgent need of money and you want to sell your website as quickly as possible. But, your website as not gained much traffic and you decided to buy traffic. Now, please don’t do this there are lot of ways to make money online. But, when you decide to start your online journey in website selling don’t cheat your buyers. Always karma wins and some day this will happen to you and at that time you will feel how the buyer would have felt. Don’t think that the buyers will pay whatever amount you ask for. A website’s price is not determined in some random thoughts. There are lot of factors which needs to be considered before deciding upon your price. Let me list out some of the factors which are very important when deciding upon your price. In most of the cases the websites revenue is calculated by just calculating it’s 12 months revenue. But, this is flexible for high quality website this can go up to 24 months. There are many websites out there where there is still a lot of space for improvement. In many cases these improvements would be in monetization techniques like affiliate marketing and SEO. For these type of websites the above 12 months rule will not apply. These websites can be sold even higher than 24 months revenue. When you are in a state of confusion talk with a website broker who knows the trade. Most of the time your website sells for more when it goes through a broker. Since, there will be client list with a broker and he knows who will be your website and for how much. If your website is custom coded and unique. If there is not much competition in your niche, then most probably your website would sell for more. With the help of WordPress anyone can create a website within minutes. So, finding a custom coded website as become quite rare. There are different type of user traffic for a website like students, bankers, business people, self help groups…etc. Find who comes to your website the most often. Purchasing power varies for different people when your major source of traffic is students there is not much you can do other than selling them books or job offers. On the other hand if your major source of traffic is professionals like bankers or business people. Then there are many ways to monetize your website. You can price your website much higher than normal. This is very important for safety of your website’s transaction. Don’t use PayPal for selling your website. Although the commission rate is less with PayPal, there is not much protection for digital transaction. If a buyer charges a charge back even after buying your website. PayPal will most probably favour the buyer since there is no proof for your website transaction. It becomes very difficult to prove your digital transaction when a buyer uses a proxy whois. So, better be safe use escrow for all your transaction. It will be worth your time and effort. Many buyers not only see the quality of website, they also see the reputation of the seller selling the website. So, try to improve your reputation and don’t get negative feedback in Flippa. To gain good reputation always follow up with the buyer even after selling your website. Make sure that all the queries of the buyer is solved. This is the most neglected part by many sellers in Flippa. Once they sell a website they forget about the website. What happens here is, many buyers take a look at your previous sales. When the website you sold is not live anymore the buyer restrains from buying your website. Now that we have seen about the seller let us see what a buyer needs to do before buying a website. Why do you think a seller is going to sell you a profitable website? Either he is in urgent need of money or the business is failing. Now there is a 90% chance that the business is failing. So, you need to be very cautious and make your due diligence before you make your decision. Like for sellers there are also few thumb rules for buyers before making their decision to buy a website. Although, the above mentioned points are self-explanatory let me explain why these points are extremely important. The first information you get about a website is it’s selling description. Now, read this description at least more than twice. Try to find, if there are any anomalies between the information given in description and the reality. In most of the cases the seller would hide some facts within the description. For example, many sellers in their description would claim that they are “not aware of any penalty as far as they know”. Note these words in the description and ask many questions related to them. This step is very important if you don’t want to get cheated. It is easy to find a faker face-to-face, on the other hand it is very hard to find faking in written communication. your next question based on the answer given. If a person is selling you a lie, always there would be a loop hole search for it and find the truth. There is only way to find a lie it is you should know the truth beforehand. For example, if you know that the seller has used paid advertising ask the question whether he has used any paid advertising? If the answer is No, then there is a high chance the seller is faking the stats. Google analytics is the most trust worthy indicator for the website’s traffic. Check at least 12 months traffic data of the website through google analytics. If you find any discrepancy in traffic like there would be spike in traffic in some days and in other days there would be less traffic or no traffic at all. Many sellers would claim that they have just now installed analytics code and they have only few months of traffic data. Don’t believe them be very cautious and make your decision. If the website’s traffic comes from different traffic sources like for example 65% organic, 25% direct and 10% social then the website is stable and is a good source of revenue. On the other hand if the major source of traffic comes from a single source then it won’t last long and sure to crumble. This is again a very important step to assess a website, use a tool like google’s keyword planner in finding the keywords for which the website is ranking and also find the search volume of those keywords. You can also use google’s keyword planner to find the search volume of the keywords. If the keyword’s search volume is high and if the website is ranking high in search engines then it is a clear indication of a successful website. Amount of visitors is not the only factor to determine the website’s worth, there are also many other factors like website’s niche, age, ad competition..etc. Hence, check the source of revenue for the website and ask for proof from the seller. AdSense is the best revenue maker for any website. Many times a website is sold after getting banned by AdSense, so make sure that the website is not banned by AdSense. The easiest way of doing this is ask the seller to run the AdSense code in the website. If you find that the website is banned by AdSense don’t wait for a second move away from the website. A non-compete agreement is very essential in the long run. Most probably the seller is an expertise in the website’s niche and he might create a similar website again. Hence, signing a non-compete agreement with the seller for at least 3 years drives away this fear. Also signing a non-compete agreement with the seller is an indicator that seller is genuine. However skillful you are, it is very hard to manage the first few months of running the website. You would encounter a lot of doubts and queries. So, always make sure that the seller is ready to reach for any queries or support for the first few months.